Photo of Hopper the famous meteorite finding dog with Rob Wesel, West, TX. Hopper found the meteorite in the photo. A 6 second plus Fireball 30 minutes & 17 seconds past midnight PST last night (2/27/09) a georgeous Fireball blazed across the N. Central California Area lasting apprx. 6.5 Seconds. DALLAS - Police say a 6-pound chunk of metal that crashed through the roof of a Dallas home was part of a machine that was grinding up an unwanted tree nearby. Sgt. Gil Cerda says: "Mystery solved." So much for the theory it could have been a piece of debris from this month's collision of Russian and U.S. satellites. Cerda says the metal chunk was a grinding tip of a mulching machine being used by a tree disposal service crew. No one was hurt when it went flying Tuesday. Senior Cpl. Janice Crowther said no charges will be filed against the business because it was an accident. The satellite debris theory also came up when a fireball streaked across the Texas sky Feb. 15. That turned out to be a meteorite. It also surfaced last week when a piece of metal crashed through a New Jersey warehouse. That was another errant piece of a mulching machine. WEST — Meteorite hunters have descended in droves to the countryside surrounding this farming community, searching for the elusive pieces from a fireball that flared across the daytime sky over Central Texas and then broke apart. But while the fireball and its accompanying sonic boom Feb. 15 were spectacular, West residents say they’ve got better things to do than hunt for the thousands of fragments that litter the land and might not even be on their property. Spring planting is a focus for the farmers now. That meteorite hunters from across the country are asking to traipse across their fields looking for stones the size of a pecan or smaller at a crucial time for planting has more than a few farmers and ranchers perturbed. In some cases, people didn’t ask and trespassed. Island residents are being urged by Maria Mitchell Association director of astronomy, Vladimir Strelnitski, to keep their eyes open for meteorites around Surfside and the south shore in the coming days following an unconfirmed sighting of a fireball blazing across the early-morning sky Friday, Feb. 20 at 4:30 a.m.
Terry Galschneider was up early watching television when she said a dramatic orange fireball "lit up the sky" for five seconds. She said the fireball was too large and bright to have been a shooting star or a helicopter. Her full description to Strelnitski left him to "not exclude that it fell in the ocean, but maybe even on land. "The object's brightness suggests it would be relatively close to Galschneider, although its lack of sound made that even less possible to tell for certain. He said it was highly unlikely to have been debris from colliding satellites.The sighting was not confirmed by either Nantucket airport officials orby the police, and no other reports of fiery objects in the sky Friday in Massachusetts have been made to NASA, or to astronomy departments at Boston University, the University Massachusetts at Lowell, or the American Meteor Society. Other islanders who may have spotted the fireball are encouraged to contact Strelnitski at the Maria Mitchell Association at +1(508) 228-5273 . Though unlikely, Strelnitski said discovering a meteorite - or part of one - on Nantucket would be unprecedented and could yield important information to scientists. People around Surfside especially are encouraged to look for unusual small craters with valleys on the surface with strange objects inside. Meteors can be a piece of metal, a greenish or grayish piece of stone, or a black piece of organic matter that resembles coal called carbonatious condrite, the rarest of all meteorites. Scientists have long debated the cause of the dinosaurs' extinction about 65 million years ago. The remnants of a large volcanic eruption in the Faroe Islands. These eruptions can go on for millions of years. Around this time a giant meteorite struck the Gulf of Mexico. But the extinction also seems to coincide with massive and long-lasting volcanic eruptions in India known as the Deccan Traps. So which event was responsible? And are these phenomena linked? New research now shows that this combination of meteorite impact andlarge-scale volcanic activity - known as flood basalt eruptions - is not unique. An international team of researchers looked at a 30-million-year-old meteorite crater in Belarus called Logoisk. They found that this too coincided with volcanic eruptions further south which covered Yemen and Ethiopia with basalt rock. These events are similar to those that occurred 65 million years ago, but on a much smaller scale. The scientists suggest such coincidences may be more common than previously thought. Dr Sarah Sherlock from the Open University and lead author of the paper, says, 'If you have a flood basalt then people wonder if there's also an impact. ''There will be, almost certainly,' she added. According to the paper, a meteorite will strike the Earth and leave a crater the size of Logoisk on average once every 1.5 million years. Flood volcanic eruptions occur over several million years, so a Logoisk-sized crater is likely to occur during each of the 16 identified periods of flood volcanism on Earth in the last 360 million years. However, researchers do not think there is a causal link between flood volcanism and meteorite impact. 'There is simply no geological evidence to link the two,' says Sherlock. To determine the precise age of the Logoisk crater the researchers used argon dating. 'Argon dating is very versatile.' said Sherlock. 'It's the only technique that can be used to date both [impacts and flood volcanism].' Samples of material from the crater were gradually heated using an infrared laser, causing the release of argon gas. The ratio of two isotopes of argon released in the gas gives an accurate indication ofthe age of the sample. Using this technique, the researchers showed that the two events occurred simultaneously. One question raised by the results was why the meteorite impact and flood volcanism 65 million years ago wiped out much of life on Earth, including the dinosaurs, but the similar events 30 million years ago did not. According to Sherlock, it was down to the size of the events. 'These coincidences in Earth's history are not as rare as people think,but in order to actually do significant damage to the environment they have to be really, really big.' Sherlock added. Together, the 65-million-year-old Chicxulub crater in the Gulf of Mexico and volcanic eruptions that produced the Deccan Traps eruption 65 million years ago released 8000 gigatonnes (Gt) of sulfur dioxide, causing global environmental damage. By comparison the Logoisk and Afro-Arabian events released only 30Gt - insufficient to cause change on a global scale. On 24 February Comet Lulin will make its first visit to the inner Solar System, streaking past the Earth at a distance of 38 million miles, or 160 times further than the Moon. 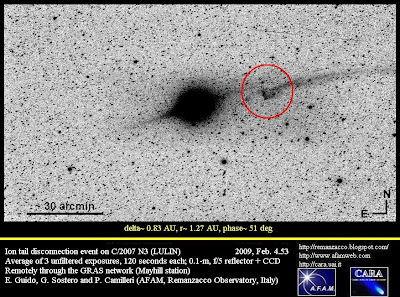 Comet Lulin, formally known as C/2007 N3, was discovered last year byastronomers at Taiwan's Lulin Observatory. Nicknamed the "green comet", Lulin's atmosphere contains poisonous cyanogen and diatomic carbongases. Researchers at the University of Leicester will be using NASA's Swift satellite to monitor the comet in X-ray, ultraviolet and optical light as it closes in on the Earth this week. "The wonderful ease of scheduling of Swift and its joint UV and X-raycapability make Swift the observatory of choice for observations like these," says Dr Julian Osborne, leader of the Swift project at Leicester. The University of Leicester played a major role in developing Swift's X-Ray Telescope. This image of Comet Lulin taken 28 Jan merges data acquired by Swift's Ultraviolet/Optical Telescope (blue and green) and X-Ray Telescope (red). At the time of the observation, the comet was 99.5 million milesfrom Earth and 115.3 million miles from the Sun. Image: Univ. of Leicester/NASA/Swift/Carter et al. Comets are thought to represent some of the most pristine ingredients ofthe Solar System. They are made up of dust, gas and ice, and as they approach the Sun, the frozen components sublime and stream out in tails. Swift observations of the comet on 28 January revealed that it is certainly active. "The UVOT data show that Lulin was shedding nearly 800 gallons of water each second," says team member Dennis Bodewits, a NASA Postdoctoral Fellow at the Goddard Space Flight Center in Greenbelt,which is enough to fill an Olympic-size swimming pool in less than 15 minutes. Although Swift can't see water directly, ultraviolet light from the Sunquickly breaks apart water molecules into hydrogen atoms and hydroxyl (OH) molecules, the latter of which Swift's Ultraviolet/OpticalTelescopes (UVOT) can detect. "This gives us a unique view into the types and quantities of gas a comet produces," Bodewits explains. The images taken so far reveal a hydroxyl cloud spanning a distance greater than the distance between Earth and the Moon, and a tail streaming off at an angle. Solar radiation pushes the icy grains awayfrom the comet, and as they gradually evaporate, they create a thin tail of hydroxyl molecules. Farther from the comet, even the hydroxyl molecule succumbs to solar ultraviolet radiation, breaking into its constituent oxygen and hydrogen atoms. "The solar wind - a fast-moving stream of particles from the Sun -interacts with the comet's broader cloud of atoms," says Stefan Immler, also at Goddard. "This causes the solar wind to light up with X-rays,and that's what Swift's XRT sees." This interaction, called charge exchange, results in X-rays from most comets when they pass within about three times Earth's distance from the Sun. Because Lulin is so active and is losing a lot of gas, its X-ray emitting region extends in a largecloud far sunward of the comet. The team hope that the forthcoming observations of Lulin will reveal more on the comet's chemistry andenable scientists to build up a three-dimensional picture of the cometduring its maiden voyage through the Solar System.Comet Lulin will be visible to the naked eye, and for most locations inthe Northern Hemisphere will be easiest to spot after midnight when itis high in the sky. In small telescopes it will appear as a dim fuzzy"star" - brighter in the centre and more diffuse around the edges. It will fade from view by mid-March. 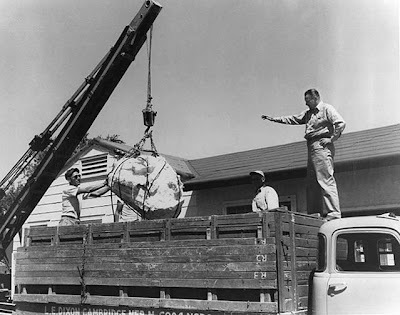 La Paz (right) directing recovery of the massive Norton County, Kansas meteorite, 1948. After a brilliant fireball and a tremendous noise, a huge shower of stones fell over a large area of Norton County, Kansas, and Furnas County, Nebraska. This meteorite, which fell on 18 February 1948, 16:56hrs, was named Norton County, and classified as an Achondrite, Ca-poor, Aubrite, fragmental breccia. Aubrites are quite rare and this is the largest known in historical times. The main mass weighing more than 1070 kg is the center of the meteorite display at the University of New Mexico in Albuquerque. Norton County is a very historical and scientifically valuable meteorite and almost impossible to obtain as nearly all of the material is in the University of New Mexico collection. Burnt oil and gas, not vegetation, may have caused the soot layer at the end of the Cretaceous period. The impact of a huge asteroid or comet at the end of the Cretaceous period 65 million years ago is generally held responsible for the sudden demise of 60–80% of all species on Earth. But new results challenge the common idea that the extinctions were partly caused by global wildfires triggered by the violent impact. kamacite has an average composition of Fe 93.1 Ni 5.8 Co 0.83 (n=4) taenite has an average composition of Fe 69.6 Ni 30.3 Co 0.30 (n=9) Taenite is much more abundant than kamacite. Many plagioclase grains exceed 50 µm in size. Some metal grains have irregular grains of troilite inside them. Metallic Cu is present in metal grains. There are some thin metal- and sulfide-bearing shock veins. The rock exhibits signficant silicate darkening. The "Ash Creek" (Doug Dawn`s proposed name for the meteorite) meteorite sample was collected by Doug Dawn, Dima, Rob McCafferty, and Sergey and sent to Dr. Rubin for analysis. The data from Dr. Rubin`s classification analysis will be sent to the Meteorite NOMCOM for approval and a final naming will be approved. Record timing for meteorite recovery and analysis; congratulations to all that worked on this!!! On Friday Sonny, Steve Arnold and I (Ruben Garcia) drove into the strewnfield bright and early and immediately started knocking on doors to try to gain permission to hunt. Upon walking up to a particular house Sonny spotted a meteorite on the porch (about 70-90 grams) he picked it up, and laid it backdown. "Ruben, did you see that fully crusted meteorite on the porch?" He Said. I couldn't believe it. He was right! Right there on the porch but no one was home...what to do? Since Sonny assured me that he wasn't going to buy meteorites when he could find them I decided to track down the owner and try to buy the specimen. I got the owners work phone number from a neighbor and called. After introducing myself and explaining what I was in town for, I told the owner that there was a meteorite on their porch. "What, you mean that black rock that the dog, Hopper, brought up and dropped on the porch?" "Yes, that one" I said. Needless to say, I drove down and did a nice video interview with the owner holding the space rock and recalling the tale. The discovery of meteorites from an asteroid that exploded over Sudan in October completes an astronomical trifecta. For the first time, scientists have detected a space rock ahead of a collision with Earth, watched it streak through the atmosphere, and then recovered pieces of it. Analysis of the meteorites could shed light on conditions in the early solar system more than 4 billion years ago. When the asteroid, called 2008 TC3, was discovered on 6 October last year, it was just 20 hours away from hitting Earth. Though the warning period was short, it was the first time a space rock had been found before it impacted the planet. Orbital calculations predicted the object would plunge into the atmosphere above Sudan at 0246 GMT on 7 October, and it arrived right ontime. Observations suggested it was no more than 5 metres across, too small to survive intact all the way to the ground and cause damage. 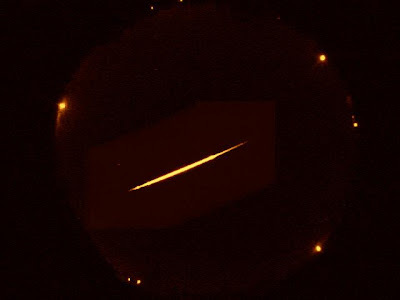 The brilliant fireball it made as it descended through the atmosphere was seen far in the distance by the crew of a KLM airliner, and was observed by various satellites, including a weather satellite called Meteosat-8. Now, a team of meteorite hunters has found fragments of the object. The meteorites are a unique group in that they come from an object seen hurtling through space before its plunge into Earth's atmosphere. An image of the first fragment found is included in the slides from Johnson's presentation (pdf) <http://www.oosa.unvienna.org/pdf/pres/stsc2009/tech-25.pdf> (see slide 19). Donald Yeomans, who manages NASA's efforts to find and track NEOs at the Jet Propulsion Laboratory (JPL) in Pasadena, California, confirmed that"quite a few" fragments have been found but declined to discuss them further. When the analysis of these rock fragments does come out, what is it likely to tell us? Meteorites in general provide a valuable record of conditions in the early solar system, such as temperature and chemical composition. And the 2008 TC3 meteorites could be especially illuminating because the parent object was observed in space before the breakup, allowing scientists to calculate its former orbit around the Sun. 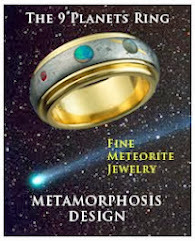 This provides precious information connecting the meteorites to their place of origin in the solar system. For most other meteorites, such calculations involve a lot of guesswork. Meteorites had previously been recovered after about 10 "fireball" events, where parent space rocks were observed streaking through the sky. But in those cases, scientists had to try to reconstruct the object's orbit based on its path through the atmosphere. "It's often very difficult to get from a streak in the sky to what theorbit was," says Allan Treiman of the Lunar and Planetary Institute in Tucson, Arizona. "But if they've got its location before it hit the atmosphere, they're far better off - that's really wonderful." Hello from Sunny Texas, under clear and starry-eyed skies at the moment, A few stones were found right at the time of the fall, however, they were not definitively identified as meteorites - though that was the suspicion and they were saved. We (Doug Dawn, Dmitry Sadilenko, Sergey Petukov) drove across the country and estimated the location of the strewn field within 48 hours of the event. With a bit of tenacity, scarcely four hours after the second day, thanks to the help of some Texas-sized hospitality, we arrived in the strewn field and found our first couple of stones and I had the distinct pleasure of shaking the finders hand and removing any lingering doubts in his mind that he had meteorites fresh from Heaven's farm. After the initial success, my good friend and asteroid hunter, Rob Matson of Los Angeles, joined up with the team. We have found some stones, but more are being found by others, and we really expect larger masses to be found, though hard work in the field definitely gets you wondering if just because such a meteoritical spectacle drops one stone, should it drop the thousands we keep expecting to see? The TKW is rapidly evolving, but the area is being hit quite hard by hunters already. This doesn't seem to be a dense fall, and some areas are very easy to search, though bramble in other areas effectively keeps those off limits. All land is private and most families keep their gun collections well oiled. In our case, the big-hearts of the landowners have humbled easily as much as the witness reports of the bolide's fragmenting itself. This is at odds with some other reports, only because residents of the area treasure their privacy and were completely overwhelmed by the wave of treasure hunters that descended. We almost lost our permission to hunt when they believed that we were somehow responsible for several meteorite hunters showing up with a news crews. Besides being quite busy, I promised to respect the anonymity of our hosts as a condition of our search, and this evening we reaped the benefits of a delicious home-cooked dinner prepared by the caring hands of our hosts at their dinner table. There is a great Texas steakhouse on I-35 which adds to the flavor for anyone wanting to experience Texas culture, cowboys and pretty cowgirls from West, TX. It has been an incredible last few days, which started by being the first to walk in a virgin strewn field, though my mother had some problems (she seems better now) that have somewhat muted what will undoubtedly be some of the most memorable moments of my life. It is way past bedtime and I will post more tomorrow. The meteorite itself is moderately to highly shocked and has a very bright, light, interior and veins of troilite and nodules of metal, and the majority of stones found are fully fusion crusted. More on the classification on Saturday. We certainly were not in a mass-laden portion of the strewn field, other hunters please take note; more likely just a place where a minor fragmentation impacted. In any case, we are committed to getting the science done so everyone else can rest assured that we have already gladly provided the mass requirements necessary for this honor. All in all, a very humbling experience for many reasons. To pick up a piece of a falling star and I thought, detect a faint sulfurous odor. It seems a dog even caught the scent of a meteorite and laid it down on the owners porch! 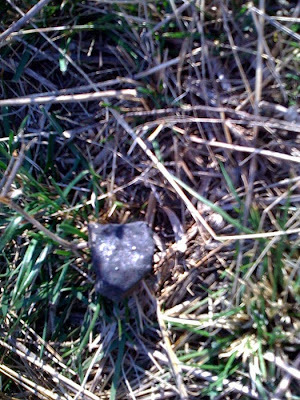 I just spoke with Mike Farmer on the telephone and they have found three more meteorites today. He said that the area is mostly farm and pasture land making it not the most idea for hunting conditions. Ron DiIulio slept for only an hour last night. The director of the planetarium and astronomy lab program at the University of North Texas couldn’t help but stay awake and study the pieces of a meteorite he found with a co-worker Wednesday. 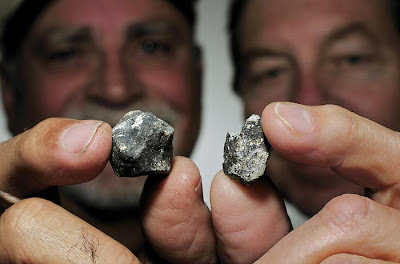 MAX FAULKNER/Special Contributor Ron DiIulio (left), director of UNT's planetarium and astronomy lab program, and UNT observatory manager Preston Starr found these fragments, believed to be from a meteor that burned up in the earth's atmosphere earlier this week, in a pasture in West. DiIulio and Preston Starr, the observatory manager at UNT, discovered the remnants of a meteor spotted shooting across the Texas sky Sunday. They found the two walnut-sized fragments off a road in West, a town about 70 miles south of Dallas. Immediately after learning about the sighting, the two men began to pinpoint the possible location with information from witnesses. The pair systematically mapped the locations and narrowed down the spot to somewhere near Fayetteville, about 230 miles south of Dallas. DiIulio said he and Starr wound their way to West and stopped at the Czech Bakery for a snack. A farmer, who noticed their official NASA-UNT outfits, approached them and asked what they were doing. “Are you guys looking for the sonic boom that rattled my walls?” DiIulio recalled the farmer asking. The farmer told the professors they should head southeast of West. DiIulio and Starr spotted the sheriff and a deputy at a gas station near the location provided by the farmer. The deputy owned some land nearby and offered to help them find the meteorite. At 5 p.m., after walking a few minutes down a gravel road, Starr and DiIulio spotted it - a small, charcoal-colored ball. Five minutes later, they found another. They didn’t use any fancy electronics - just a map, truck and their eyes. The pair were lucky they found the pieces first, he said. Scientists from Moscow and two men from Tucson were also on the prowl. DiIulio and Starr wrapped the pieces in a Ziploc bag and took them back to UNT, where they are conducting a radioisotope study today. The study will give clues about other matter in space. DiIulio said it was important to find the pieces quickly because they start to lose certain characteristics once they hit the earth’s atmosphere. Alan Rubin, a research geochemist at the University of California, Los Angeles, said the meteorite that landed in Texas is among the most common kinds -- an ordinary chondrite. He said his lab had been called on to analyzed a piece of the substance -- not from the chunks that DiIulio and Starr found -- and "it's a real meteorite, not a piece of a satellite." Though meteorites are found all over world, DiIulio considers himself lucky. Mostly what's out there are tiny pieces -- some as small as a grain of sand. “Every once in a while ... you get this,” he said. A reporter was talking with a pair of meteorite hunters Wednesday afternoon when one of them suddenly bent down and picked something up off the dirt, less than a foot from the writer’s shoe. Pay dirt. A quarter-sized, roundish piece of chondrite meteorite was the Arizona team’s first proof of a meteor that broke apart Sunday over Central Texas and now lies — by the group’s estimate — in thousands of pieces across of a swath of northern McLennan County and probably southern Hill County. “We have lots of dead-end hunts that don’t pay off like this,” said Robert Ward, 32, who has hunted for meteorites for more than 20 years. 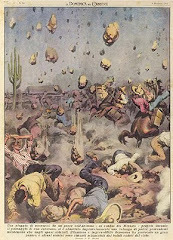 The rumble and flash of the meteor Sunday caused countless Texans to call authorities and prompted the McLennan County Sheriff’s Office to send a helicopter to search the northeastern portion of the county, including roughly where the Arizona group made their find Wednesday. To underscore that point, two rival meteorite hunters, a Russian and an American who lives in Mexico, arrived before the Arizona group looking for the rocks and visiting with residents and property owners. “The Russians beat us to it,” Farmer said, his comment sounding a bit like the 1960s space race. Karl, who usually lives in his native Frankfurt, Germany, said his father called him from Germany where video of the fireball, captured by a TV cameraman videotaping the Austin Marathon, was on the news. Shauna Russell, 23, the junior member of the group, said she and her colleagues had a good idea of where to look for the “strewn field” — the area of fallen meteorites — from triangulating the TV video and eyewitnesses who saw the fireball. It also helped to have images from Doppler radar that detected the fireball in the sky around Hubbard, she said. The chondrite found Wednesday is what meteorite hunters find 90 to 95 percent of the time, Farmer said. He estimates the strewn field to be anywhere from a mile to 2 miles wide and from 5 to 10 miles long, though it could be shorter based on the meteor’s sharp trajectory indicated in the video. The group said the meteor, which likely hit the atmosphere at about 22,000 mph, could have been anywhere from the size of a refrigerator to a pickup before it began breaking apart. Residents within a few miles of the larger pieces falling would have heard whistling sounds like artillery shell zipping through the air, Ward said. Farmer said he’s made a living for 13 years hunting and collecting meteorites, which can be sold to universities, planetariums and other collectors. Those sales help fund his and Ward’s meteorite chases, which have taken them to every continent except Antarctica on more than 50 hunts. “There is an interest. These objects are worth money,” he said. As word gets out, Farmer expects the area to overrun with professional hunters as well as amateurs, although he said he hopes people can help them find the space rocks, for which they might get paid. Pat Branch wrote: "I just heard that two University of North Texas (in Denton)> researchers recovered two meteorites near West Texas where the fireball would have landed. Hopefully we can get more details on exactly where and what types they are." Mike Farmer reports that he has also found stones from the fall!!!! Looks like Mike Farmer (well-known Tucson hunter) found a piece too. Here are pics and a video of them hunting. DALLAS — Two samples of fresh material the "size of large pecans" from a meteor that alarmed numerous residents when it streaked across the Texas sky on Sunday have been found by two University of North Texas astronomers in a pasture east of the small town of West. "The pieces that we found have beautiful ablation crust. And it's black like charcoal. Underneath this crust the color of the rock is concrete like gray," said Ron DiLulio, director of the planetarium and astronomy lab program at the University of North Texas in Denton. DiLulio and Preston Starr, UNT's observatory manager, said they found the pieces Wednesday about 5 p.m. after starting their search from Fort Worth at 3 a.m. using calculations from all of the calls they had received. DiLulio said they had just about given up looking and were driving back when a friend called and asked to meet them at a certain intersection. They said that coincided with conversations they had had earlier that day with citizens at a restaurant. "We decided rather than try to get permission from landowners, there would be pieces in a line that would spread out a mile across. We decided to just do the county roads and we just started walking down that road and it's fairly easy to see. It jumped out at us within 15 minutes," DiLulio said. "We came back to where our gut instinct told us," Starr said. He said the McLennan County sheriff and deputies confirmed what citizens had told them. "The sheriff told his deputy to take us out there," DiLulio said. The astronomers placed the samples in ZipLoc bags to keep out the air. They plan to transfer the samples to membrane cases and take them to the university for additional study. People on Sunday reported seeing a fireball streak across the sky and DiLulio said the reason it created such a fireball was because the meteor expanded and broke into pieces. The pair said they were not alone in the search and ran into others including "a commercial meteorite hunter and we wanted to get there so we could have it first for science," DiLulio said. Starr said the pair had been gathering information since they initially learned of the meteor's appearance. "We did a lot of pre-planning. We looked at the angles of what they saw in the sky and we were able to map it all out. We put a plan together and we drove around small country roads. Texas has lots of small farm to market roads," Starr said. DiLulio said he thinks there are larger pieces still to be found. He said the pair planned on returning to the areas where they had searched. "Everytime we find one we mark where it is on the map and we can measure how much material actually hit the surface of the earth," DiLulio said. West is about 70 miles south of Dallas. COMET LULIN UPDATE: Comet Lulin is approaching Earth and brightening rapidly. Observers say it is now visible to the naked eye as a faint (magnitude +5.6) gassy patch in the constellation Virgo before dawn. Even city dwellers have seen it. Backyard telescopes reveal a vivid green comet in obvious motion. Just yesterday, amateur astronomers watched as a solar wind gust tore away part of the comet's tail, the second time this month such a thing has happened. Lulin's closest approach to Earth (38 million miles) is on Feb. 24th; at that time the comet could be two or three times brighter than it is now. SATELLITE DEBRIS: More than a week has passed since the Feb. 10th collision of Iridium 33 and Kosmos 2251 over northern Siberia, and the orbits of some of the largest fragments have now been measured by US Strategic Command. Today's edition of http://Spaceweather.com features global maps showing where the debris is located. Only 26 fragments are currently plotted, but that number will grow as radar tracking of the debris continues. Check back often for updates. 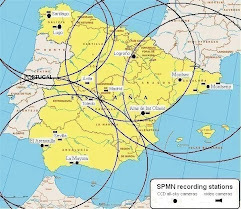 The radar tracks you referenced are great Ed. They show any meteorites would have landed about 5 kilometers SE of Lake Whitney. Although the altitude differences cause a large spread over the possible impact zone. The Fort Worth Radar (which I can see from my house) would have imaged the one on the right first and the one on the left second. 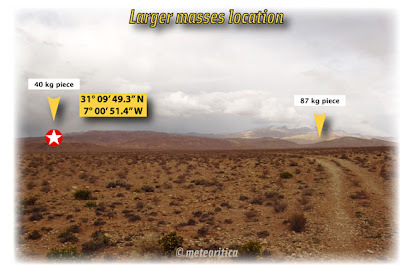 The Granger radar would have imaged the lower altitude first and the higher altitude second, so yes it would have been a reflection off an Ionization trail. The images would have been about a second and 6 degs of scan apart. My belief they were separate parts of something come from early reports from McKinney saying it was seen in the north. In the police dash cam from plano it appears to be going north to south in a more vertical direction and very high in the sky. Reports from Denton also put it very high in the sky (still confused about how this could be). The Austin video was suppose to be taken looking north giving a fall area around Marble Falls. So it must have been taken NE or ENE to give the low trajectory and east to west appearance. There is no way an object 9,000 feet off the ground can be seen from 120 miles away, so it must have been over Hearn area from the Austin video. It would be interesting to hear more reports from the Whitney, West, Mart area to try and determine if there are any possible meteorites from this one. Below are some recent papers about impact structures and alleged impactites that have appeared. The Jebel Hadid structure is formed in the Nubian Sandstone and located in southern Al Kufrah Basin. It is a 4.7 km circular feature with a set of multiple concentric annular ridges. they suggest "that the Jebel Hadid structure might represent an eroded, complex impact structure' much like the Tin Bider structure in Algeria. Its location is 20º 52' N and 22º 42' E). 2. Ghoneim, E. M., 2008, Ibn-Batutah: A possible simple impact structure in southeastern Libya, a remote sensing study. Geomorphology. vol. 103, no. 3, pp. 341-350. The Ibn-Batutah feature is a circular structure centered on 21° 34′ 10″ N and 20° 50′ 15″ E and located in southeastern Libya. It is formed in Nubian Sandstone. 3. McCall, G. J. H., 2009, Half a century of progress in research on terrestrial impact structures: A review. Earth-Science Reviews.vol 92, no. 3-4, pp. 99-116. "The reviewer presents the results of a literature search on the enigmatic occurrences of carbonado; a form (but not the only form) of polycrystalline diamond, which is mined for industrial diamonds." He hypothesizes that "carbonado does stem from terrestrial eruptive processes" and concludes that much research remainsto be performed before any conclusions can be reached.5. Schmieder, M., and E. Buchner, 2007, Short note: The Fayabasin (N Chad, Africa) – A possible impact structure? Journal of African Earth Sciences. vol. 47, pp. 62–68.The Faya basin is an almost circular structure, centered on 18º 10' N and 19º 34' E. It lies about 55 km ENE of the city of Faya (Largeau) and has a diameter of about 2 km. Possible the fall on the Earth of a meteorite. Moreover in the same timetables have been observed others 5/6 fireball to the north and center Italy. The radiating is in Antihelion (Delta Leonids). Well, in the evening (2009, Febrary 13th, at 20:03:29±1 U.T. ), over CentralItaly,a very bright fireball was detected from Rieti. The apparente magnitude was -16.9±2.7 and its time of transit was 6.2±0.1 s.
High probability of impact to ground. We're computing the possible point of intersection with Earth, from video records. Fiery debris burned through the Texas sky Sunday morning, alarming some and enchanting others but resulting in no apparent injury or damage. Video from Dallas to Austin and beyond, sightings were reported of a red and orange fireball with a small black center speeding toward Earth before burning out in a trail of lingering white smoke. Roland Herwig, spokesman for the Federal Aviation Administration’s southwest division, said the fireball was probably superheated debris from a broken satellite falling to Earth.The FAA could not directly link the debris to the reported collision last week of Russian and U.S. communications satellites, however. “It’s yet to be proved it’s those satellites,” Herwig said. However, a spokeswoman for U.S. Strategic Command said the fireball spotted in the Texas skies Sunday was unrelated to the satellite collision. Air Force Major Regina Winchester said that Joint Space Operations Center at California’s Vandenberg Air Force Base has been monitoring the debris from the collision, and that could not have caused the dramatic sight. She also said the fireball was not related to the estimated 18,000 man-made objects that the center also monitors. “There was no predicted re-entry,” Winchester said about the objects in Earth’s orbit.She said it could possibly have been a natural phenomenon such as a meteorite. It’s unclear exactly how many pieces of debris tumbled toward Texas or whether any more are on the way.The potential danger from debris did prompt the FAA to warn pilots nationwide to be aware of the hazard and to immediately report any sightings. State emergency management officials and local law enforcement agencies also were on alert across much of Texas. Based on reports of a fireball near Waco, local law enforcement officers searched for debris but found nothing, a Texas Department of Public Safety spokeswoman said. Though no one could pinpoint where the debris fell or if it even remained intact through the burnout, the fireball left an impression on those who saw it. They say it burned anywhere from a few seconds to nearly a minute. And in some areas, particularly in East Texas, there were reports of a sonic boom. While it may not be clear for some time what fell from the sky, it seemed to be a singular event.Most sightings in Texas were reported about 11 a.m. Some people thought it was a meteor. Others thought perhaps it was a plane crashing. Doug Schmidt of Richardson was driving south on Central Expressway near the Bush Turnpike when he saw a flash of light in the sky. “It was like a ball of flame with a tail. It looked like a meteor,” he said. “There was flame and then a flash and smoke trailing it. I said ‘Wow, look at that.’ ”Farther south, in Ovilla, Chris Weaver said he stepped outside and just by chance looked south. That’s when he saw a flash of orange moving fast in the sky before burning into a streak of white smoke. “If you were looking up at the southern sky, you couldn’t miss it,” he said. There have been scattered reports across the country of debris falling to Earth since the Russian and U.S. satellites collided Tuesday about 500 miles above Earth. The collision occurred over Siberia and sheared thousands of shards of debris through Earth’s orbit.Pieces of that debris will continue to float through orbit for thousands of years or more, while other pieces will at times fall to Earth, probably likely burning up as they pass through the atmosphere, experts say. Staff writer Jeff Mosier and The Associated Press contributed to this report. Limestone County sheriff's office reported contact from someone who claimed to have a picture of the fireball and a smoke trail and a Plano,Texas, police cruiser may have capture images from a dashboard camera. What must be sonic booms were reported in Hill and Navarro counties, south of Dallas, Texas. Two towns named in one TV story (a Fox station in the Dallas, Texas, area) where sonic booms were heard were Hubbard and Penelope. One private report I've seen mentions what I guess was a smoke trail that lasted about ten minutes. That report said the fireball was visible for about eight seconds and that it was going south to north when seen to the east of Austin. Another report from people who apparently were in a car says they saw going NNE while they were traveling northeast. This was a significant fireball, and I hope another video was made from somewhere. I saw a mention that a police-car dashboard camera may have captured it. This was at 11:00 AM local time -- broad daylight. By the way, online reports now cite the FAA and STRATCOM as saying it was a nature event completely unrelated to the collision of the satellites. I would tend to thank that this might have been detected by a DSP satellite, but if so we might never hear about it. Astronomer Bill Cooke of NASA's Meteoroid Environment Office is stating that this event was asteroid of about 1 meter, 20 Km/s. Two local TV weather blogs have radar images from 11:03 AM (local, 17:03 UTC) Sunday that show two echoes, one in southern Hill County near Hubbard and another, larger one in the northern corner of McLennan County (Waco), just north of the small town of West and south of the small town of Abbott in Hill County. They both agree that in one pair of images from Fort Worth radar the right-hand or eastern echo is higher in the atmosphere than the larger one to its left. They say that the one of the left was at about 4,000 feet and the one one the right at about 7,000 feet above the ground. I assume these are echoes of a smoke or debris trail, but maybe they could be plasma (?). I don't know why there are two separate echoes. I believe that weather radars rotate once per minute. In the KVUE-24 blog, there are two pairs of images, each from a different radar center, and the altitudes of the echoes are given different altitudes for the Granger radar than for the radar from Fort Worth. However, in this one it appears that the blogger or his source has mis-stated (reversed) the altitudes of the echoes in the second pair of images (from Granger radar). From Hearne to West in McLennan County yields a more or less SSE to NNW track, and the two radar echoes seem to have it descending as it went in that direction. I've read one report in which the eyewitness says she saw five streaks. Another story on one of those websites says that so many 911 calls were received in Williamson County (immediately north of Austin) that they sent out a helicopter to search for a fallen aircraft. It would be very nice, if this was detected by DSP satellite, if they would report it as has been done in the past (several years ago). KENTUCKY FIREBALL: On Friday, Feb. 13th, around 10:00 pm EST, people in central Kentucky heard loud booms, felt their houses shake, and some saw a fireball streaking through the sky. The nature of this event is still under investigation. Possibilities include a small asteroid or a piece of space junk entering Earth's atmosphere. National Weather Service reports that the fireball was debris from the Feb. 10th collision of Iridium 33 and Kosmos 2251 satellites may be premature. Stay tuned for updates. I've spent several hours going over internet forums, scanner reports, etc. and the preponderance of sonic boom reports are coming from London, KY. Some reports from Richmond, KY to the North of London. Visual Observers have been mentioned from Southern Ohio, Central Kentucky, Middle Tennessee, and Western South Carolina. Those with detail seem to confirm this was a steeply vertical track. Based on what I have gleaned, and trying to be conservative, nothing thus far precludes that this could have been a meteorite dropping fireball. When/if we get satellite observation data please give me a heads up. London is on Interstate 75 near the Tennessee state line North of Jelico, TN west of Middlesboro, KY. South of Lexington KY. I am about 100 miles away in Knoxville. I'm putting together a resource pack to take to the London Corbin area Tuesday. If anyone is headed to the area please let me know so we can coordinate. The Kentucky fireball Friday night (9:00 PM Central,10:00 PM Eastern on 13 February; 03:00 UTC Feb 14) was observed from at least four states: Kentucky, Ohio, Tennessee, and West Virginia. It seems to have been going east to west. One good report from Owensboro, KY, says that from there it appeared at 45 degrees altitude, disappeared at 15 degrees, and (if I understand correctly) was going almost straight down. This observer estimates the magnitude at -6 to -7 -- from west central Kentucky. For decades, space experts have warned of orbits around the planet growing so crowded that two satellites might one day slam into one another, producing swarms of treacherous debris. It happened Tuesday. And the whirling fragments could pose a threat to the International Space Station, orbiting 215 miles up with three astronauts onboard, though officials said the risk was now small. “This is a first, unfortunately,” Nicholas L. Johnson, chief scientist for orbital debris at the National Aeronautics and Space Administration, said of the collision. It happened some 490 miles above northern Siberia, at around noon Eastern time. Two communications satellites — one Russian, one American — cracked up in silent destruction. In the aftermath, military radars on the ground tracked large amounts of debris going into higher and lower orbits. “Nothing to this extent” has ever happened before, Mr. Johnson said. “We’ve had three other accidental collisions between what we call catalog objects, but theywere all much smaller than this,” the objects always very small and moderate insize.The communication satellites, he added, “are two relatively big objects. 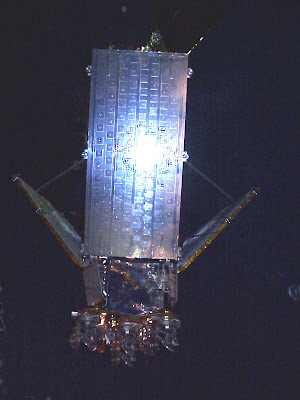 ”The American satellite was an Iridium, one of a constellation of 66 space craft. Liz DeCastro, corporate communications director of Iridium Satellite, based in Bethesda, Md., said that the satellite weighed about 1,200 pounds and that itsbody was more than 12 feet long, not including large solar arrays.In a statement, the company said that it had “lost an operational satellite” on Tuesday, apparently after it collided with “a nonoperational” Russian satellite. “Although this event has minimal impact on Iridium’s service,” the statement added, “the company is taking immediate action to address the loss. ” The company’s hand-held phones can be used anywhere around the globe to give users voice and data communications. Mr. Johnson said the Russian satellite was presumably nonfunctional. Officials at the Russian Embassy in Washington could not be reached for comment. Mr. Johnson said the United States military’s tracking radars had yet to determine the number of detectable fragments. “It’s going to take a while,” he said. “It’s very, very difficult to discriminate all those objects when they’re really close together. And so over the next couple of days we’ll have a much better understanding.”At a minimum, Mr. Johnson added, “I think we’re talking many, many dozens, if not hundreds.” The debris could threaten the space station and its astronaut crew, he said. “There are actually debris from this event which we believe are going through space station altitude already,” he said. The risk to the station, Mr. Johnson added, “is going to be very, very small.” In the worst case, he said, “We’ll just dodge them if we have to. It’s the small things you can’t see that are the ones that can do you harm. ”In Houston, International Space Station controllers have often adjusted its orbit to get out of the way of speeding space debris, which can move so incredibly fast that even small pieces pack a destructive wallop. John Yembrick, a NASA spokesman in Washington, said the agency now judged therisk of collision with the speeding fragments to be “very small.” The threat, headded, is defined and acceptable. Mr. Johnson, who works at the Johnson Space Center in Houston, said the new swarms of whirling debris might also eventually pose a threat to other satellites in an orbital chain reaction. “What we’re doing now is trying to quantify that risk,” he said. “That’s a workin progress. It’s only been 24 hours. We put first things first,” meaning the station and preparing for the next shuttle mission. We would like to take this advantage and to invite you to wonderful spring Prague to meet other colleagues, to share your experiences and to celebrate with us the 50th anniversary of the Pribram meteorite fall. The Pribram meteorite fall on April 7, 1959 was the first scientifically observed meteorite fall. 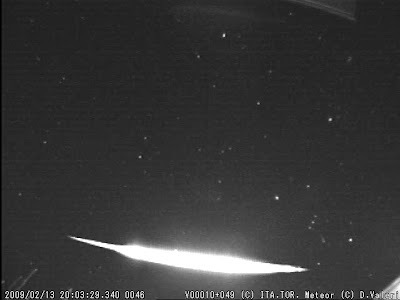 The associated bolide was captured by the photographic cameras of the double-station meteor observation program initiated and led by the Czech astronomer, Zdenek Ceplecha, who also analyzed all the available data and predicted the location of the meteorites. To date there have been only 9 cases where a meteorite dropping bolide was observed instrumentally, so that the trajectory and orbit could be determined precisely and – at the same time – the meteorite was recovered. Nevertheless, thanks to various observational programs and modeling efforts, our understanding of bolides and associated phenomena has increased dramatically over the past 50 years. We believe, that the conference will be devoted not only to celebrating the anniversary, but also to offer a forum to discuss recent achievements in this field and future programs. On Monday, Feb. 9th, the full Moon will pass through the outskirts of Earth's shadow, producing a penumbral lunar eclipse. The event will be visible to the naked eye as a dusky shading of the northern half of the Moon. Maximum eclipse occurs between the hours of 1400 and 1520 UT (6:00 am - 7:20 am PST). The timing favors observers in east Asia, Australia, Hawaii and western parts of North America. Visit http://spaceweather.com for a visibility map, animations, and more information. Two papers, both of which dispute the occurrence of wildfires associated with a hypothetical impact event at the start of the Younger Dryas, have been recently published. Proceedings for the National Academy of Science. Charcoal in soils of the Allerød-Younger Dryas transition were the result of natural fires and not necessarily the effect of an extra-terrestrial impact. Netherlands Journal of Geosciences (Geologie en Mijnbouw) vol. 87, no. 4, pp. 359-361. Kitzberger, T., P. M. Brown, E. K. Heyerdahl, T. W. Swetnam, and T. T. Veblen, 2007, Contingent Pacific–Atlantic Ocean influence on multicentury wildfire synchrony over western North America. Proceedings of the National Academy of Sciences of the United States of America. vol. 104 , no. 2.pp. 543-548. On February 6, 2009 there were 1022 potentially hazardous asteroids. COMET TAIL: Comet Lulin (C/2007 N3) is approaching Earth and putting on a good show for amateur astronomers. Yesterday, Feb. 4th, observers witnessed a "disconnection event." A gust of solar wind tore off part of the comet's tail in plain view of backyard telescopes. Photos of the event are featured on today's edition of http://spaceweather.com/. Activity in the comet's tail and atmosphere will become even easier to see in the weeks ahead as Lulin nears closest approach on Feb. 24th. At that time the comet will lie only 38 million miles from Earth and it should be visible to the naked eye. In the meantime, please note that Feb. 5th-7th, is an especially good time to find Comet Lulin in the pre-dawn sky. The comet is gliding beautifully close to the naked-eye double star Zubenelgenubi. Just point your binoculars at the double star and the comet will materialize right beside it. Visit http://spaceweather.com/ for photos, sky maps and more information. Comet Lulin glides by Zubenelgenubi, a double star at the fulcrum of Libra's scales. Zubenelgenubi is not only fun to say (zuBEN-el-JA-newbee), but also a handy guide. You can see Zubenelgenubi with your unaided eye (it is about as bright as stars in the Big Dipper); binoculars pointed at the binary star reveal Comet Lulin in beautiful proximity. Closest approach! On this special morning, Lulin will lie just a few degrees from Saturn in the constellation Leo. Saturn is obvious to the unaided eye, and Lulin could be as well. If this doesn't draw you out of bed, nothing will. 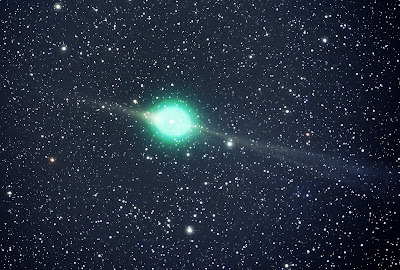 Ye notes that Comet Lulin is remarkable not only for its rare beauty,but also for its rare manner of discovery. "This is a 'comet ofcollaboration' between Taiwanese and Chinese astronomers," he says. "The discovery could not have been made without a contribution from both sides of the Strait that separates our countries. Chi Sheng Lin andother members of the Lulin Observatory staff enabled me to get the images I wanted, while I analyzed the data and found the comet. "Somewhere this month, Ye imagines, another youngster will bend over an eyepiece, see Comet Lulin, and feel the same thrill he did gazing at Comet Hale-Bopp in 1996. And who knows where that might lead...? "I hope that my experience might inspire other young people to pursue the same starry dreams as myself," says Ye. While the /Xam Bushmen believed the stars were formerly people, some !Kung Bushmen taught that stars are, in fact, small creatures, and look like tiny porcupines - they have little legs, ears, teeth and are covered with tiny spines. Another !Kung account says that stars are actually ant lions, watching from overhead with their bright eyes. When they are hungry and see an ant, they quickly fall to the ground to catch it. Some say that all the stars fall to the ground each morning, and we see them on earth as insects. The Ibibio of Nigeria spoke picturesquely of the stars as “Sand of the Moon”. Visit PsychoHistorian.org for more lore on the Sun, The Milky Way, The stars around Orion, Venus, comets and meteors. Thank you to Paolo Gallo, M.V., Venezuela for the forwarded post.